A fisherman once said: “I have a fish pond about 60 acres, the annual feed became a big problem, cause price of feed markup every year, while fish price do not so, I want to make fish feed by own.” Problem of feed is really a big deal, because most of the fishermen can not buy high quality fish feed in the market, and different growth stages of fish needed different nutrients. So considering the cost and quality, making own feed is the best choice. To process fish feed by own, there are three conditions need to meet: raw material, feed formula, and processing machinery. The raw material should have high quality, low price, convenient transportation, and supply be stability. The more types of raw materials, the better, so as to make the necessary amino acids in the feed to achieve balance. Nutrients essential to fish are the same as those required by most other animals. These include water, proteins (amino acids), lipids (fats, oils, fatty acids), carbohydrates (sugars, starch), vitamins and minerals. Fish meal, soybean meal, fish hydrosylate, skim milk powder, legumes, and wheat gluten are excellent sources of protein. Additionally, the building blocks of proteins (free amino acids) such as lysine and methionine are commercially available to supplement the diet. Oils from marine fish, such as menhaden, and vegetable oils from canola, sunflower, and linseed, are common sources of lipids in fish feeds. Cooked carbohydrates, from flours of corn, wheat or other ‘breakfast’ cereals, are relatively inexpensive sources of energy that may spare protein (which is more expensive) from being used as an energy source. The variety and amount of vitamins and minerals are so complex that they are usually prepared synthetically and are available commercially as a balanced and pre-measured mixture known as a vitamin or mineral premix. This premix is added to the diet in generous amounts to ensure that adequate levels of vitamins and minerals are supplied to meet dietary requirements. Maximum satisfy the fish’s needs of various essential amino acids, absolutely can not use the raw materials of mildew. Cottonseed meal and rapeseed is cheap, and protein content is higher, but because they were containing gossypol and glucose Glucosinolates of anti nutritional factors, using too much can affect the growth of fish. Therefore the amount generally does not more than 10%. Many farmers prefer to use cheap oil residue and Patty, but there are a lot of animal fur in this kind of raw material, which effect of grinding and pelleting process, it is not easy to digest. The fat in cracklings and patty is saturated fat, its utilization rate for fish is low, excessive intake of fat rancidity will cause fish to develop fatty liver disease, so the amount of this raw material should be controlled at less than 5%. In the selection of raw materials it should also pay attention to the water content, high moisture will reduce the nutritional value of the feed, may also lead to feed mildew, shorten the storage time of the feed. Different species of fish not only have different nutritional requirements, but they also seem to have different palate requirements. For tilapia: Wheat bran 30%, soybean 35%, fish meal 15%, corn 5%, sophorae leaves 5%, barley 8.5%, auxin 1%, salt 0.5%. For grass carp: Corn flour 55%, fish meal 10%, soybean flour 15%, wheat bran 5%, sweet potato powder 12%, salt 0.50%, auxin 2%, dicalcium phosphate 2%. For catfish: Miscellaneous surimi 25%, soybean 15%, peanut meal powder 15%, rice bran 26%, cassava flour 10%, wheat flour 5%, yeast powder 1.5%, salt 0.5%. Feeds formulated are dry type, with a final moisture content of 6–10%, semi-moist with 35–40% water or wet with 50–70% water content. Most feeds used in intensive production systems or in home aquaria are commercially produced as dry feeds. Dry feeds may consist of simple loose mixtures of dry ingredients, such as “mash or meals,” to more complex compressed pellets or granules. Pellets are often broken into smaller sizes known as crumbles. The pellets or granules can be made by cooking with steam or by extrusion. Depending on the feeding requirements of the fish, pellets can be made to sink or float. The process of producing fish feed pellet typically includes starting materials → mixing → transferring → extrusion puffing → transferring → drying → cooling → screening → spraying oil → seasoning → packaging. Here the most important processing is extrusion puffin, there are two type fish feed extruder: Dry type fish feed extruder and Wet type fish feed extruder. 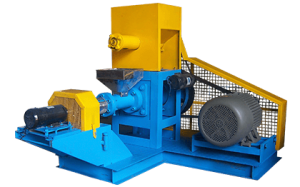 The Working principle: The materials were processed from the hopper into the crushing chamber, hit by the high-speed rotating parts then break down, and change the motion direction of the material. Because the speed rotation working damage the layer of sedimentary materials, the material follow the rotor moving, in this processing, particles repeatedly collided by the working parts and machine body, causing collision and friction between pellets, which is gradually grinding to its diameter and making it is smaller than the screen diameter. Under the action of centrifugal force and air flow, the crushed pellets was discharged through a sieve into the powder room then out from port. This kind of machine, grinding fineness determined by sieve pore size, users can select screen according to feed particle size requirements. Hammer is vulnerable parts, users should always check the wear condition, when the hammer was wear no water, you can flip or turn it. But Hammer installation location cannot replace each other, or be renew, so as not to affect the balancing of the rotor. 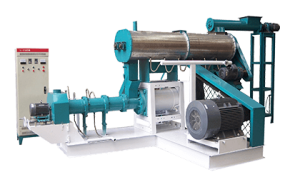 Both fish feed extruders are widely used for producing grains into high-grade aquatic feed pellets for fish, catfish, shrimps, crab etc. And this feed pellet machine can make various grain waste into animal feed pellets with rich nutrition and easy digestion. Feed pellets produced by this kind of feed pellet machine have smooth surface, floating more than 12 hours. 1.Dry type extruder is the type of machine that does not require a steam boiler for heat or steam injection or jacket heating, so it is cheaper than the wet type, and it suit for small and medium fish farm. 2.The heart of wet type fish feed extruder machine working is: preconditioning, cooking and die shaping. High temperature and high pressure process can kill the salmonellosis and bacterial infections and also makes the pellets easily to digest. 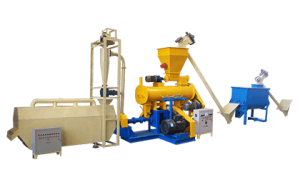 3.The feed pellet made by wet type fish feed pellet machine is more smooth and with better quality because the material is ripen and mixed enough in the conditioner compared with the dry type extruder. 1.In the processing of making pellet, high temperature and high pressure can kill germ, eggs, fungi and so on, then adding a mount of drug in the raw material can prevent and cure diseases. Diphenylguanidine, keqiu powder can against coccidiosis, Antibiotics such as oxytetracycline can improve immunity, preventing diarrhea. 2.Feed particles, made by high temperature and high pressure, can increase the hardness of feed, extending floating time. 3.Because the food material is adequate mixed in the process, during the hot and humid season, if placed a long time, the pellets won’t be fermented sour. Nutritional components adequately intake without waste. 4.Short period of high temperature and high pressure in the processing can cause some changes in nutrients, when the feed goes ripening, some paste and glycation will produce, and taking out fragrance to improve palatability, it is easy to digest. 5.Fish feed extruder machine full use of feed resources, reducing costs. Due to the harvest feed ingredients have a certain seasonality, and feed prices are not the same at different times, so when prepare of feed formulation, to meet the nutritional needs, try best to select of low-cost raw material making pellets, and a variety of materials will make nutritional be balanced.